DeviantArtist lexinator117 claims this is chart is the "Size Comparison of EVERYTHING." 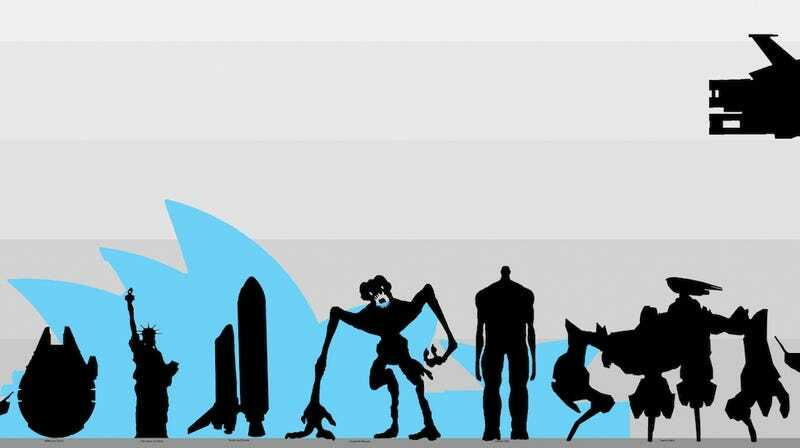 While we won't go that far, we will happily agree that is is a size comparison of many of scifi's greatest monsters, robots spaceships, and even if it's incomplete, it's still completely awesome. PopSci happily broke down the extremely horizontal picture into manageable chunks, so head to lexinator117's DeviantArt page to see the chart in its full glory. If you doubt any of these measurements, feel free to take it up with the artist. According to lexinator117, "ALL SIZES are well researched, you are welcome to ask how. If a size could not be proven for something, i did not include it. please comment any objection with accurate reasons why."